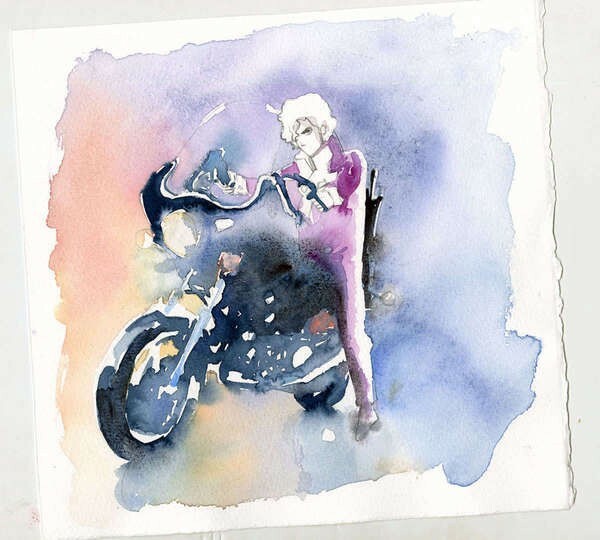 The amazing artist and friend of the org, Clementine Campardou aka Blule has launched her Kickstarter for "On the One", an amazing coffee table book of brand new paintings she's made of Prince. You might recall that Prince was a fan of her artwork and used her painting for his stage clothes and backdrops. I was honored that she asked me and my partner to create the promo video which you can watch on the Kickstarter page. As of writing, the project is already 30% funded (in the first day) and almost all of the "Early Bird" slots (which allow you to get the book at a lower price) are gone. Please check out the campaign, images, and ways that you can buy it here! It promises to be an amazing book! Hmmmm - Ok so the early bird was $250 for the first 100 people who were lucky enough to get the email in time to purchase (due to time zones) .............but the jump then to $350 is just too much. I would have rathered see a set price for everyone as it would have seemed fairer. I feel to have to pay an extra $100 feels like we are being penalised and a little bit of a rip off as the pricing leap is so great. I do love her work and have a Piano & Microphone print from SOH hanging proudly in my living room, but I cannot justify the $100 jump in price because I missed out (like many others) on the early bird special. It's not uncommon on Kickstarter to have early bird specials. I'm not sure Clem expected all of them to go in the first day though! I think $350 is more than fair for the book considering how high quality it is and the fact that it's an individually numbered limited edition. These won't be available again, certainly not in this unique handcrafted format anyway. It's just about demand really. "Piano & A Microphone" Tour Books sell for over $350, and in terms of physical construction, they are just a regular tour book - special due to the circumstances of them, but they don't feel premium, and this book does. As Militant said, we were not expecting the Early Bird to go that fast. We even considered, literally minutes before launching, reducing the number. Thing is, it only had a marginal impact on the final price. Producing such a book in such limited quantity is that expensive, I'm afraid. We know we are leaving people out and are very sad about it (but we do not give up). Worldwide shipping is not cheap too. As mentioned on the page, we make 0 profit at the goal level. We do hope it will become a sort of collector, but even without that, it will definitely be a special object. Thank you for your passion, and support. I'm sad that the book has to be so expensive (even the early bird price was too rich for my blood), but I understand why it is. I hope those who can afford to buy copies will treasure them. looks well worth the money..missed the early bird offer though..fell asleep on the bloody sofa!! Not really a fan of all the auctions, tell tale books etc BUT this I can handle. The photographs books and this book are a must for your shelf. I agree, this is a beautiful book and I'd love to have it. But I just can't justify springing that kind of money on it. I did see the early bird pricing but still couldn't justify it. I'll just have to be satisfied with the beautiful shirt with her work front and back that is coming my way! If we'd had a choice of white or an ash gray background, I'd have bought both the shirt and the hoodie in ash gray. White is gonna be tough to keep white. 21 Nights was a mass manufactured book by a publisher. And although it's large and the content is great, it's not a high quality book. Standard printing for a photo book. This is a limited edition, self-created, self-published work of art. Bound with Japanese lace and fabric on the highest quality textured paper. Created with love by the artist herself. It's unique. It's art. It's not a commodotized book like 21 Nights. The two things really aren't comparable. It's a one of a kind collectors item. Yes, I hope she is albe to get this mass manufactured. Because a lot of people love her work, but cannot afford the book. I wish we would have had a choice of a darker color for the hoodie. I also would love it if the estate would sell it as a print. Laura, did you end up getting one or the other? Mine should be here any day now. I agree too about being interested in a print. I can do some of that, but I won't use his likeness..
she's talented and Pretty like me! Ida Nielsen is writing the foreword for the book! Only 9 days left to order if you haven't already.